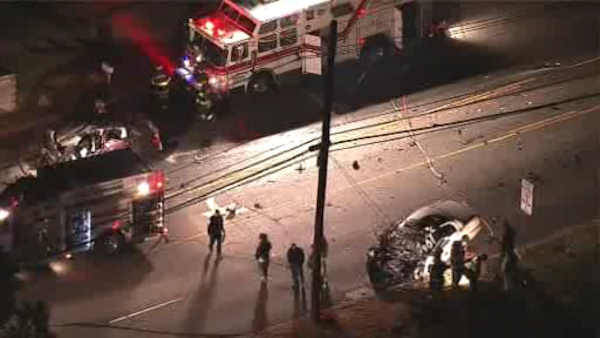 NewsCopter 7 was over the scene of a fatal crash in East Brunswick. EAST BRUNSWICK, New Jersey (WABC) -- Two people were killed in a head-on crash involving two vehicles in East Brunswick, New Jersey Tuesday morning. The cars collided on Ryders Lane just after 4:30 a.m.
One person was pronounced dead at the scene. A second was pronounced dead at the hospital. The fatalities were confirmed by East Brunswick Mayor Kevin McEvoy. Police say it is not yet known whether drugs or alcohol were involved. Ryders Lane was closed after the crash, but has since reopened in both directions.